Pre-heat the oven to 250ºF. Pre-heat a teaspoon of EVOO in a nonstick skillet over medium heat. Spread one tablespoon of pepper jelly on a tortilla and add the tortilla to the pan. Cover half of the tortilla with about 1/2 cup cheese and top with a quarter of the apple slices. Fold the naked half of the tortilla over and cook for a couple of minutes on each side until brown and crispy and the cheese melts. Transfer the quesadilla to the oven to keep warm, then repeat with the remaining ingredients. Cut each quesadilla into four wedges and serve. In Recipes-list.com we have selected the most viewed recipes from category - uncategorized . Enjoy the best recipes specially selected for you! 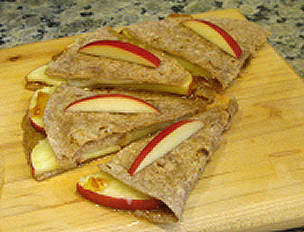 Apple Jack Quesadillas is the right choice that will satisfy all your claims.